You are here: Home » MEDIA » Books » Shambling Towards Hiroshima by James Morrow (book review). 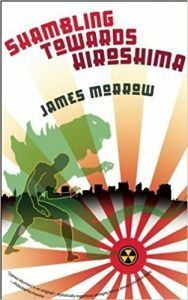 Shambling Towards Hiroshima by James Morrow (book review). ‘Shambling Towards Hiroshima’ is a novelette, written as an autobiographical suicide note by the protagonist Syms Thorley. He’s a B-movie star who specialises in playing costumed monsters and villains. The novelette jumps between the present Syms who is contemplating suicide in 1980s and Syms in the height of his career in the 1940s. Thorley recounts the events that so drastically changed his life in 1945. As World War Two was entering its final stages, the USA was struggling to convince the proud Japanese to surrender without having to send US troops in. With the Manhattan Project well underway, in this novel the bomb plan had hit a snag. America had run out of weapons grade uranium for the moment and having to resort to their Plan B, the Knickerbocker Project. This was a biological weapons project, which had been set up alongside the Manhatten Project, albeit with a decreased budget. Syms, who has managed to dodge the draft and kept acting in his monster movies, is approached by the Navy to use his skills to help end the war. The Knickerbocker Project has created giant, fire-breathing reptilian monsters that can live underwater. The Navy intending to send these monsters to destroy Japanese cities are convinced by the scientists to invite a Japanese delegation and perform a scaled-down demonstration of the impact of these weapons to persuade them to surrender without further bloodshed and destruction. While the scientists are able to breed scaled-down versions of the monstrous lizards, the mini-versions, while physically terrifying, are completely tame and placid. This is where Syms comes in. As one of the best monster actors, Syms has been designed a suit to resemble the lizards and must take on the role of destroying a scale model of a Japanese town so convincingly that the delegation convinces the Japanese government to surrender. ‘Shambling Towards Hiroshima’ is a fun read. It’s mostly comical and light-hearted but there is an important message in it. Should we really be creating such devastating weapons at all? Sym’s narration reminded me the movie ‘Singin’ In The rain’, a movie about making a movie. The tone of the novel is personified by Syms, who for most of the book, rarely takes anything seriously and is focused entirely on himself till the conclusion of the novel. I suppose this can also be compared to the creators of the weapons who didn’t seriously consider what they had done till it was too late. « Jasmyn by Alex Bell (book review).